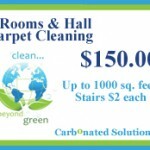 Coupon spec ials from Carbonated Solutions. Cleaning your carpets, tile, grout, natural stone, or upholstery doesn’t need to be a drag this holiday season. That’s why Carbonated Solutions® of Las Vegas offers you convenient appointments with I.I.C.R.C. certified carpet, upholstery, tile, grout and natural stone cleaning services. In order to take advantage of our holiday coupon specials, please click on the coupon of your choosing and print it out. Always mention your holiday coupon specials when scheduling your cleaning appointment. Carbonated Solutions of Las Vegas can not guarantee service availability 15 days prior to holidays. Please schedule in advance to be sure to get the day and time you are wanting service. Coupons specials for cleaning and maintenance product’s must be picked up at our location. 3535 W. Harmon Ave Ste. G, Las Vegas, NV. 89103.